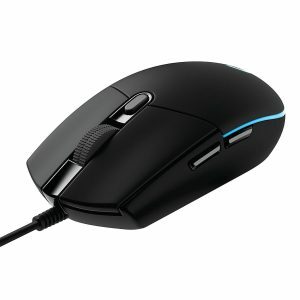 If you are looking for a budget mouse, you should definitely consider the Logitech G203. With its wide DPI range and recent firmware update, this product is suitable for those who want an affordable gaming mouse that works well. The Logitech G203 is equipped with 6 programmable buttons, RGB lighting and wide scroll wheel with a textured, rubbery surface. The plain shape of the mouse makes it easy to use. The Logitech G203 is ideal for advanced gaming as its response time is 8 times faster than a standard mouse. Every click and move is almost instantaneous. The Advanced Button Tensioning also reduces the force required to click the right and left buttons and provides exceptional click response, consistency and feel. The sophisticated 8000 dpi sensor provides remarkable accuracy, consistency, control and tracking speed regardless of your gameplay style. The classic design of the mouse was inspired from the Logitech G100S mouse, which is a favorite of eSports pros and gamers worldwide. It was optimized and re-engineered for gaming and daily comfort, versatility and durability. The mouse has 2 buttons on the left side and DPI settings button behind the scroll wheel. The position of the side buttons prevents accidental clicks while staying easily accessible. The mouse, however, lacks ergonomics for right-handers as players tend to spend long gaming sessions with the mouse in their right hand. The surface of the mouse is completely plastic. It has no soft-touch rubber or textured side grips. The Logitech G203 features one-zone RGB lighting and onboard memory, allowing you to move your settings from one computer to another and play a game right away. The backlighting on the mouse looks good. You can select your lighting from 16.8 million colors. The scroll wheel has no lighting. The Logitech G203 feels big enough that you should be able to grip it as you want. The mouse is comfortable to hold as its sides slope in. The Logitech G203 has a plug and play function. By installing the Logitech Gaming Software app that you can download for free, you can access the settings of the mouse and update its firmware. The software allows you to reprogram the 6 buttons of the mouse. You can also set up various profiles for different games. The software will scan your computer and look for the games you’ve installed and offer to create profiles for each so that you can customize the mouse buttons and the keys on the keyboard. You only need to download the software from Logitech’s website and install it. The dips on the right and left clicks help keep your fingers gripped on the mouse when you move it around. The mouse comes with a rubber cord as well. The rubberized cord doesn’t completely get rid of drag, but it has a lighter effect on mouse movement if ever drag occurs. The gaming software also allows you to modify the DPI sensitivity levels. For instance, you can set between 1 and 5 active levels that you will cycle through. You can set a high DPI setting for regular action and low DPI setting for sniper shots. The software also allows you to set one of the DPI settings as the Shift setting and a mouse button as the DPI Shift button. This allows you to keep as many DPI settings active on the Logitech G203 as possible. You can also have a DPI setting for your desired function. 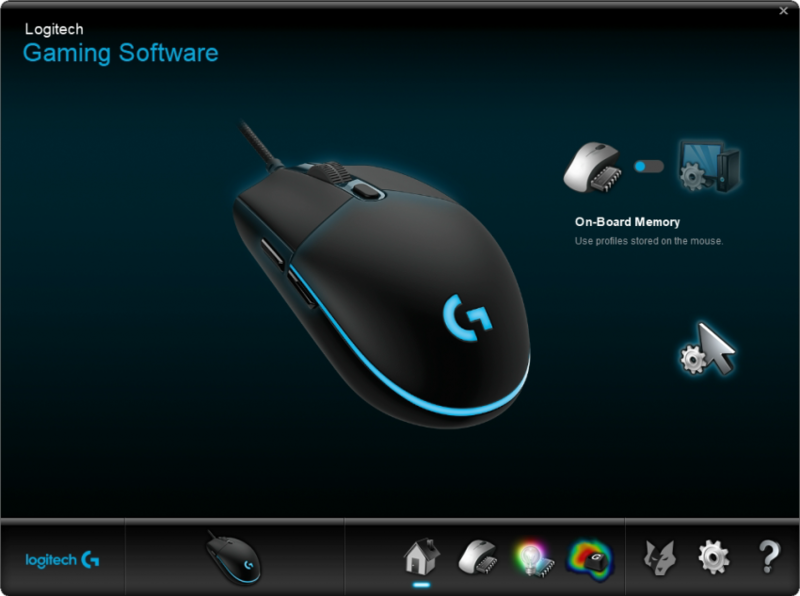 The Logitech Gaming Software allows you to customize the RGB lighting as well. You can select a breathing effect, solid color and color cycle as well as adjust the rate of change and brightness for your desired effect. The software also allows you to choose a custom lighting effect for your profiles. You can choose from 3 different lighting effects. “Color Cycle” causes the Logitech G203 to cycle through all colors. The “Off” effect allows you to set one solid color, while the “Breathing Effect” allows you to create a custom breathing effect. This effect allows only one color. The Logitech Gaming Software allows you to remap the buttons. Each button has a label, so you will find it easy to change the settings. The Command Editor pops up when you double-click on a button. You can assign mouse functions, keystrokes, text, macros, multimedia, blocks and other functions from here. The software also allows you to change the report rate and DPI settings. The mouse provides 5 DPI settings that you can adjust in increments of 50 and up to 8000 DPI. This rate is good enough for most people. The Logitech G203 provides smooth and accurate performance. Some people may not like the plastic surface of the mouse as it is slippery. You also need to apply more force in order for the scroll to turn. The mouse, however, has a maximum DPI of 8,000. This is perfect for those who have a large monitor. The forward and back buttons are also positioned in a nice spot. Although these buttons are quite basic compared to the buttons found in higher-end models, they still get the job done. The mouse is also backed by a 2-year warranty. If you are not satisfied with its performance or you received a defective item, you can contact Logitech’s support team and ask for a replacement or refund. The Logitech G203 provides a high DPI setting. It has an all-plastic shell that feels slippery. However, the Logitech G203 still offers an accurate performance and it also comes with gaming software from the same company. The Logitech Gaming Software allows you to make separate profiles for various games. You can also customize the lighting and effects of each profile. The DPI Shift function is also a great feature that you can use for sniper targeting. The best thing about the Logitech G203 is that it is offered at a reasonable price. If you are looking for a budget mouse that provides a solid performance, you should definitely consider the Logitech G203.